This value-packed packed set for the serious CISSP certification candidate combines the bestselling (ISC)² CISSP Certified Information Systems Security Professional Official Study Guide, 8th Edition with an all new collection of Practice Exams to give you the best preparation ever for the high-stakes CISSP Exam. (ISC)² CISSP Study Guide, 8th Edition has been completely updated for the latest 2018 CISSP Body of Knowledge. This bestselling Sybex study guide covers 100% of all exam objectives. You'll prepare for the exam smarter and faster with Sybex thanks to expert content, real-world examples, advice on passing each section of the exam, access to the Sybex online interactive learning environment, and much more. Reinforce what you've learned with key topic exam essentials and chapter review questions. Along with the book, you also get access to Sybex's superior online interactive learning environment that includes four unique 250 question practice exams to help you identify where you need to study more, more than 650 Electronic Flashcards to reinforce your learning and give you last-minute test prep before the exam, a searchable glossary in PDF to give you instant access to the key terms you need to know for the exam. 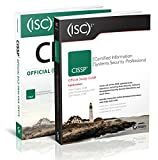 Add to that the all-new (ISC)² CISSP Certified Information Systems Security Professional Official Practice Tests, 2nd edition with 2 more complete 250-question exams and another 100 questions for each of the 8 domains and you'll be as ready as you can be for the CISSP exam. The AWS Certified Solutions Architect Study Guide: Associate (SAA-C01) Exam is your complete and fully updated resource to the AWS Solutions Architect - Associate certification. This invaluable Sybex study guide covers all relevant aspects of the AWS Solutions Architect job role, including mapping multi-tier architectures to AWS services, loose coupling and stateless systems, applying AWS security features, deploying and managing services, designing large scale distributed systems, and many more. Written by two AWS subject-matter experts, this self-study guide and reference provides all the tools and information necessary to master the exam, earn your certification, and gain insights into the job of an AWS Solutions Architect. Efficient and logical presentation of exam objectives allows for flexible study of topics, and powerful learning tools increase comprehension and retention of key exam elements. Practice questions, chapter reviews, and detailed examination of essential concepts fully prepare you for the AWS Solutions Architect – Associate certification. Access the Sybex interactive learning environment and test bank, including chapter tests, practice exams, electronic flashcards, and a searchable glossary of key terms. The AWS Certified Solutions Architect Study Guide: Associate (SAA-C01) Exam enables you to validate your skills, increase your competitive advantage, and take the next step on your career path. Comprehensive and up-to-date content and superior study tools make this guide a must-have resource for those seeking AWS Solutions Architect – Associate certification. This is the perfect book to keep all your password information together and secure. This book has approximately 108 pages and is printed on high quality stock. In addition, the pages are alphabetized so you can quickly and conveinently find what you need. Whether its social media, bills or online account info, you can store everything in this trendy password book! A cross between Jen Hatmaker and Rosalind Wiseman, VIRAL PARENTING is a guide to raising responsible, safe, and communicative kids in the digital world. Mindy shares practical tools for having honest conversations with kids of all ages about privacy, bullying, respectfulness, and family time, while emphasizing the importance of trust and open communication. These strategies are timeless--whether applied to texting, snapping, Facebooking, kiking, or whatever social media platforms await us in the future, this book is ultimately about teaching children about personal responsibility and safety. Mindy shares practical tools for creating family rules for kids of all ages about privacy, bullying, respectfulness, and family time, while emphasizing the importance of trust and open communication. Using family contracts, guided conversations, device checks, and respectful but firm oversight, the McKnights have raised a close knit family and navigated the complexity of being world-wide internet celebrities with grace. McKnight will show any parent of any child or teen how that's done--setting non-negotiable guidelines and offering a savvy perspective toward privacy that audience have been begging for.